I love good bread, especially sourdough bread. My personal favourite is moist rye sourdough bread of the Danish type. Super-Yum! 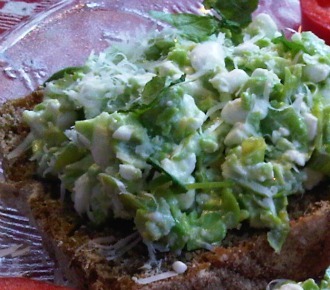 My breakfast bread toppings can be anything from scrambled eggs to ripe avocado. I often eat sourdough bread with houmous (hummus) and sliced avocado. I absolutely love it! 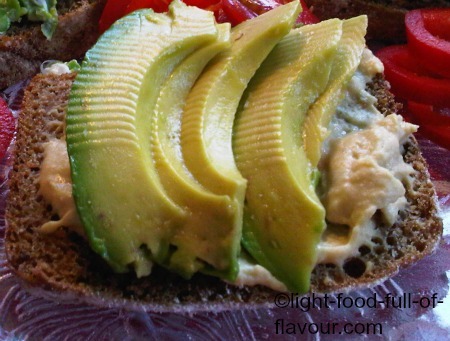 Avocado and hummus are both really nutritious, and as long as you don't overdo it - no more than 1/2 an avocado and a couple of tablespoons of hummus - neither of them will affect your weight very much. Make it even healthier and tastier by adding sliced raw red pepper (bell pepper) as well. 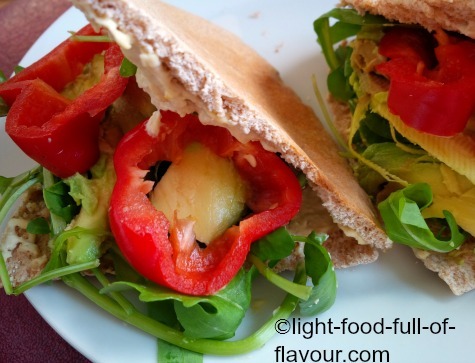 I sometimes toast wholemeal (wholewheat) pitta bread and fill it with houmous, dark green leaves (water cress, spinach, arugula), sliced avocado and red pepper (bell pepper). It's a bit messy to eat but Oh So Tasty! On a walking trip in Spain I ate toast with olive oil, grated tomatoes, parsley and at times garlic for breakfast while in Andalusia. 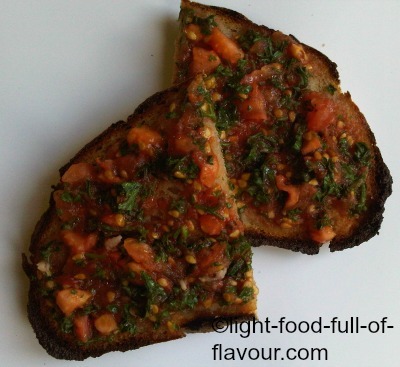 I make it with sourdough bread - Sourdough Bread With Tomatoes And Garlic. Worried about your breath - just leave out the garlic! This is a really tasty soybean topping for bread. Edamame beans - immature green soya beans (soybeans) – are considered to be a source of complete protein and are low in saturated fat while jam-packed with dietary fibre. I personally make sure that the edamame beans I use are not from a GM-crop. Mix the mashed soya beans with the cottage cheese, Parmesan cheese, parsley and lemon juice and season with a little bit of salt and pepper. If you want to take this a step further and make it even healthier and tastier, top with sliced avocado and red or yellow pepper (bell pepper). Mix together the cottage cheese with the feta cheese and season with a bit of black pepper. 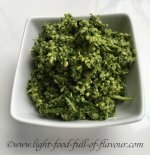 Divide the mixture over slices of bread and top with watercress or chopped chives and red or yellow pepper (bell pepper). As an alternative, you could swap the pepper (bell pepper) for smoked salmon.